The causal structure of spacetime and standard cosmological models can be easily mapped into hyperbolic geometry. 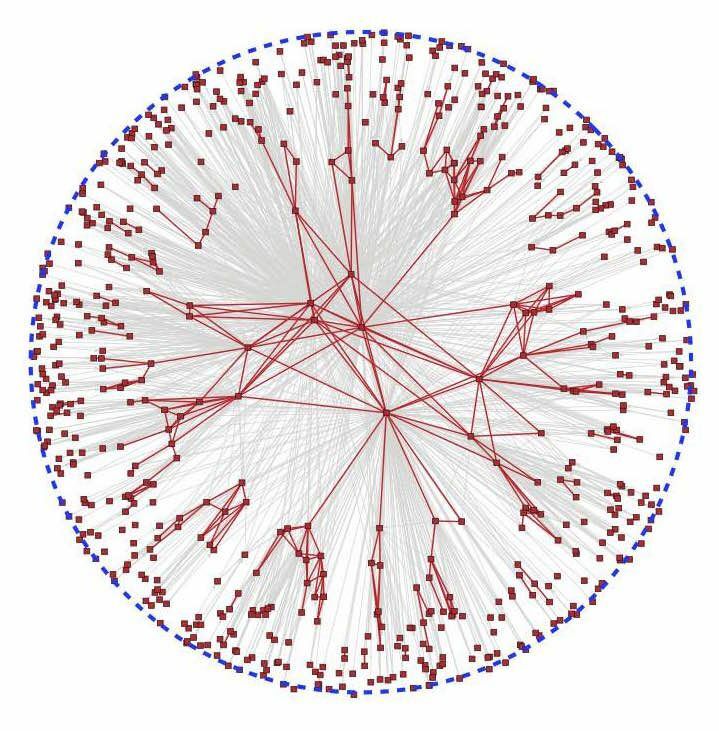 Quite interestingly, networks that arise in this context are extremely similar to networks we find in domains as diverse as cell biology, social sciences, or socio-technological systems, like the Internet or the world wide web. All real networks are different, but many have some structural properties in common. There seems to be no consensus on what the most common properties are, but scale-free degree distributions, strong clustering, and community structure are frequently mentioned without question. Surprisingly, there exists no simple generative mechanism explaining all the three properties at once in growing networks. Here we show how latent network geometry coupled with preferential attachment of nodes to this geometry fills this gap. We call this mechanism geometric preferential attachment (GPA), and validate it against the Internet. GPA gives rise to soft communities that provide a different perspective on the community structure in networks. The connections between GPA and cosmological models, including inflation, are also discussed. Networks often represent systems that do not have a long history of study in traditional fields of physics albeit, there are some notable exceptions, such as energy landscapes and quantum gravity. Here, we consider networks that naturally arise in cosmology. Nodes in these networks are stationary observers uniformly distributed in an expanding open Friedmann-Lemaitre-Robertson-Walker universe with any scale factor and two observers are connected if one can causally influence the other. We show that these networks are growing Lorentz-invariant graphs with power-law distributions of node degrees. These networks encode maximum information about the observable universe available to a given observer.